Gyles Brandreth said on his Radio 4 programme recently that learning poems can ‘fundamentally change people’s lives’ by delaying the onset of dementia. A big claim! He quoted from a study by scientists from Cambridge University’s Memory Lab, who have found that decline is not inevitable if we keep our brains active, and learning poetry is a brilliant way to do it. So if we make the effort to learn poems by heart, we can have confidence that our brains aren’t turning to mush. The research included studying neural oscillations (brainwaves, to the rest of us) in babies, and found that, remarkably, nursery rhymes have rhythms that coincide with brainwaves. This helps babies to understand language and speech, so the more we recite poetry and nursery rhymes to them, the easier they will find learning to speak, and even read, later on. So, with brain health in mind, Brandreth has set us all a challenge: to learn a poem by heart in time for Christmas. (He is doing this, to recite to his family.) This challenge is supported by the Duchess of Cornwall, who says that she learnt poems as a child and now recites them to help her drop off to sleep. She finds this calming, and there’s no pressure – you just let your brain do its thing. I thought I’d give this a go. 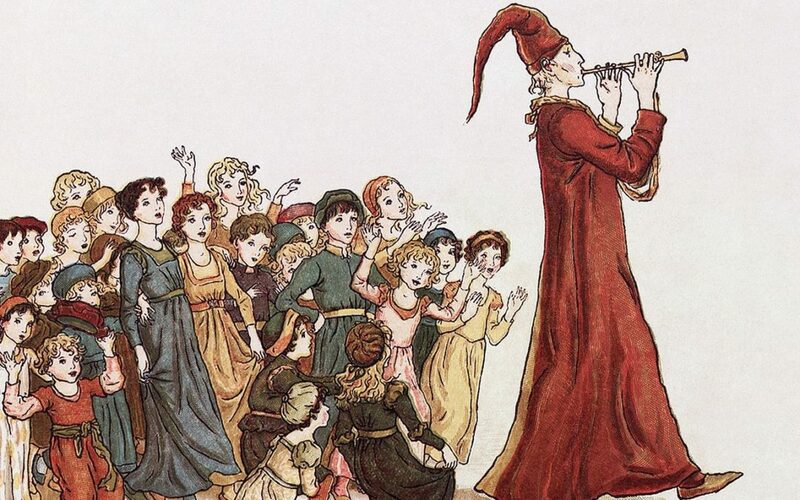 I’ve always loved The Pied Piper of Hamelin by Robert Browning, written in 1842. It relates a tale set in Germany in the 1200s, and gives us a glimpse of life then that we can still relate to today. The rhymes are wonderful. I remember my dad reciting parts of it to me, and laughing at the thought of the rats building nests in men’s Sunday hats, and at the mayor, ‘when at noon his paunch grew mutinous, for a plate of turtle, green and glutinous’. Reading out loud is supposed to help the learning process but I don’t go this far – my family suffer enough! I have followed the Duchess’s advice, and repeated the lines (silently!) as I’m nodding off. And I can report that this sleep-inducement method works! I now know a small part of it well. But maybe not well enough – rather than Hamelin town, I’ve found myself recalling that Camden Town’s in Brunswick. But it’s fine, because I then know I’m on my way to the Land of Nod. Which poems resonate with you? Dame Judi Dench learnt Shakespeare as a child, and says his writing is easy to learn because “Shakespeare’s verse goes with the beating of your heart”. Or maybe something more modern? When Serena Williams won her seventh Wimbledon tournament back in July 2016, the BBC showed some of her career highlights. The soundtrack was Williams reciting a poem by Maya Angelou called Still I Rise, which has the line: ‘I am the dream and hope of a slave’. Afterwards, the Twittersphere was abuzz with viewers not only thrilled with her victory but saying they’d been moved to tears by the poem. There is some dreadful poetry out there, in my opinion. But when you find one you love, that connects with you, discipline yourself to learn it and treasure it! It will bring you pleasure, maybe bring back good memories, maybe help you sleep, but best of all, will help you keep an active brain! No need to inflict it on your family at Christmas, though. Prof Goswami’s paper, A Neural Basis for Phonological Awareness, has been published by the Association of Psychological Science.